Note: Images displayed on the GCPA site are of the exact apartments that we privately manage. Location of this apartment: Level 3, Boulevard Tower, 6 Orchid Avenue, Surfers Paradise, Gold Coast. This 1 Bedroom Apartment is located on level 3 of the H Residences building in Surfers Paradise and offers guest City Views of Surfers Paradise. 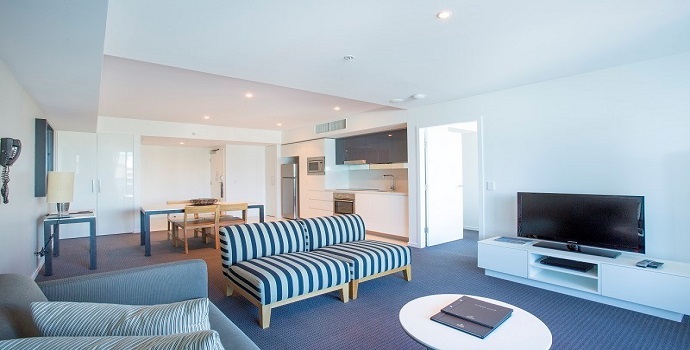 Gold Coast Private Apartments (GCPA) independently manages this fully self-contained, One Bedroom Gold Coast Apartment. This one bedroom apartment features an open plan living room, floor to ceiling windows and air conditioned rooms. There's a fully equipped kitchen, with a full size fridge, microwave and dishwasher. The bathroom has a shower and bath tub (towels supplied). Please note we supply a set of bathroom towels only, we encourage guest to bring their own pool / beach towels as towels at the Pool desk are for Hilton guest use only. The master bedroom has 1 x king bed (linen supplied), a wall mounted LCD television and bed side tables. In the living room there’s a 2 and a half seat sofa bed, coffee table, LCD television and DVD player. This 1 Bedroom Apartments features a dining table with 4 chairs. Also, included is FREE in room Wi-Fi connection. On the balcony there is an outdoor table with 2 chairs. The laundry has an ironing board, iron, vacuum cleaner, washing machine, dryer and basin. This 1 Bedroom Apartment on Level 3 is ideal for 2 Adults and 2 Children. 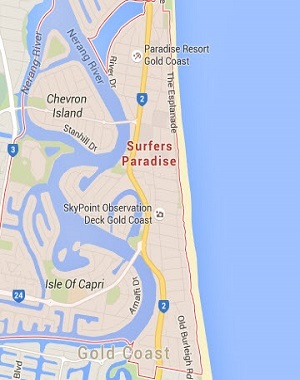 Please note; we are in no way associated nor affiliated with the onsite management, Hilton Surfers Paradise. The onsite management / front desk do not provide any services to our privately managed apartments. Towels at the Pool Deck are for Hilton hotel guest use only. For all enquiries, please contact Gold Coast Private Apartments. Parties and functions are strictly prohibited. We do not offer luggage storage, however we may offer a complimentary early check-in or complimentary late check-out subject to availability. We do not provide any housekeeping services as our privately managed apartments are fully self-contained, however should you require housekeeping services during your stay, please contact GCPA to arrange a quotation as additional charges apply. Within 24 hours of booking your apartment you will receive a subsequent email with detailed instructions about our personal check-in service. GCPA guest are unable to check-in or check-out at the properties onsite reception desk, nor will GCPA guest receive room service or porter service from the onsite management. For all enquiries, please contact Gold Coast Private Apartments. Arrivals from 6pm onwards will incur a $40 check in fee payable directly to your Host.